If you'd prefer to discuss your Holiday Home requirements on the phone, request a call back and one of our Sales Team will be in touch very shortly. We now have a fabulous double lodge for sale on a premium plot on the park. Internally fitted out to a very high standard with open plan living area and kitchen (with breakfast bar), large hallway leading to dining room (can be utilised as a third bedroom if required), two double bedrooms with the master benefiting from walk in wardrobe and en-suite shower room with both having large fitted wardrobes. Full main bathroom with bath. Lots of storage throughout. Externally there is decking to front, side and rear with access directly onto the 10 acre meadow at the rear. Parking for 2 vehicles. Viewing recommended to appreciate what a fantastic holiday lodge this is!! Badgers Retreat Holiday Park is a luxury holiday lodge park set in 26 acres of private grounds offering the ultimate in peace and tranquility. Located between the Yorkshire Dales National Park and the North Yorkshire Moors, Badger’s Retreat is the perfect base from which to explore this amazing landscape. From the heather clad moorlands to the spectacular Swale and Wharf Rivers, natural beauty is all around giving you a sense of well-being and serenity. The region offers impressive landscapes which can easily be explored on foot or by bike. Best Park Home Finance offer loans of up to 70% of the purchase price of a residential park home and up to 80% of a holiday home or lodge, subject to terms and conditions. Our loan terms range from one month to 15 years and there is no age limit on loan applications. Additional payments can be made without any penalties. We are authorised and regulated by the Financial Conduct Authority, firm reference number 715454. Black Horse Finance is a leading holiday home finance provider in the UK and can help you purchase your dream holiday home on a beautiful Wyldecrest Holiday Park. We are very proud to partner with Black Horse and assist with the purchase of your very own static caravan or holiday lodge. 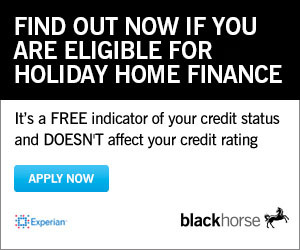 Click here now to find out if you qualify for finance.